Photo by Bryan Stevens A White-breasted Nuthatch perches at the end of a branch. The power of flight gives most birds a perfectly valid reason to disregard the power of gravity. The family of tree-clinging birds known as nuthatches lives an even more topsy-turvy lifestyle than many other of their winged kin. Nuthatches prefer a headfirst stance as they search for food in the nooks and crannies in tree trunks and branches. Photo by Bryan Stevens A White-breasted Nuthatch plucks a sunflower seed from a feeder. At my home, nuthatches typically remain aloof from the rivalry always ongoing between the chickadees and titmice. The white-breasted nuthatch is also a no-nonsense visitor. Rarely distracted by disturbances among other birds, this nuthatch is content to grab a seed and go or hang on to the wire frame of a suet basket and peck off chunks of suet. Photo by Bryan Stevens A Red-breasted Nuthatch visits a feeder for peanuts. These displays are usually brief, unless they are directed toward another white-breasted nuthatch. A male-female pair of these nuthatches can peaceably visit a feeding area at the same time. Two male nuthatches — or two female nuthatches for that matter — show little toleration for each other. Their little dances of defiance are in these cases demonstrated for each other. Eventually, one nuthatch will give way, but these are stubborn birds, much more set in their ways than chickadees and titmice. Photo by Bryan Stevens Red-breasted Nuthatches are occasional winter feeder visitors in Northeast Tennessee. In our region, the stubby red-breasted nuthatch is another member of the family that occasionally finds its way to our yards. Smaller than the related white-breasted nuthatch and, as far as I can tell, complacent in the company of chickadees and titmice, the red-breasted nuthatch is always a welcome visitor. It has a tell-tale “yank yank” call that it produces when excited that sounds very much like little tin horns. The red-breasted nuthatch, perhaps because it spends so much of the year in more remote areas, can also be amazingly tame when it pays a winter visit. Photo by Bryan Stevens A Brown-headed Nuthatch seeks out a sunflower seed from a feeder. 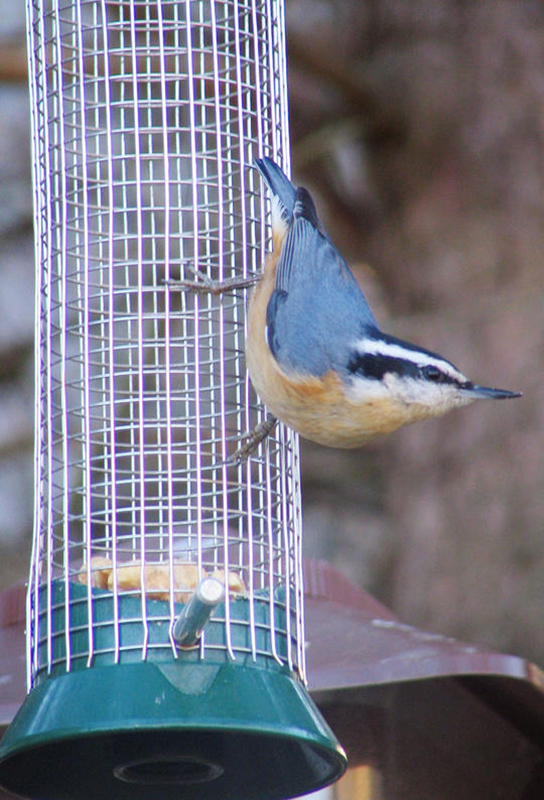 Both of these nuthatches can be attracted to feeders by offering peanuts, sunflower seeds and suet. 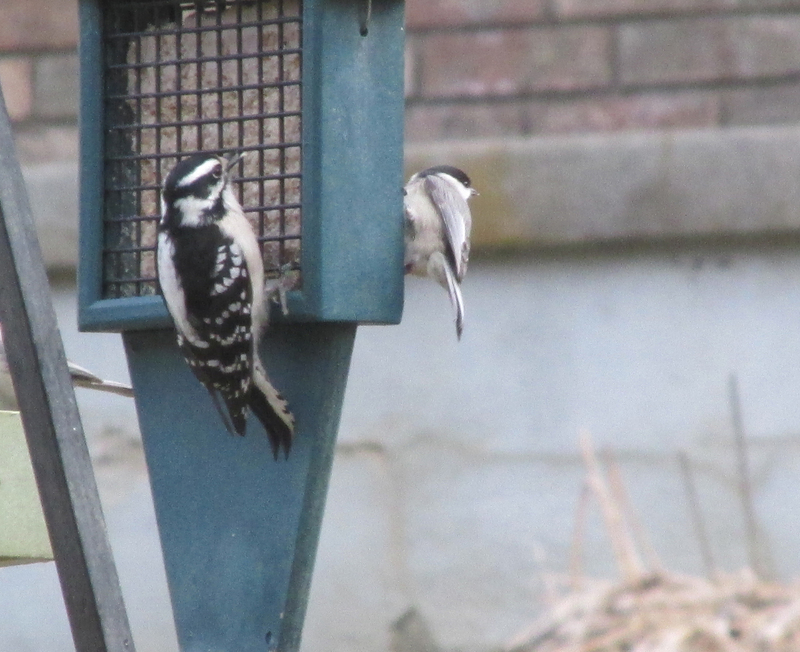 They are also cavity-nesting birds, but are more reluctant about accepting a nesting box as a place to rear young. 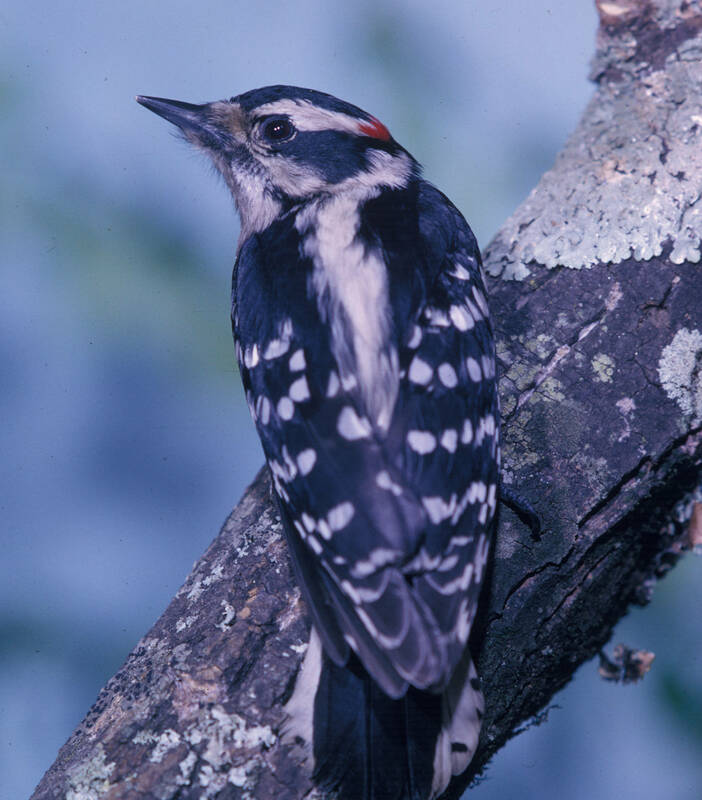 They will gladly accept an old woodpecker hole or other natural cavity in a tree. 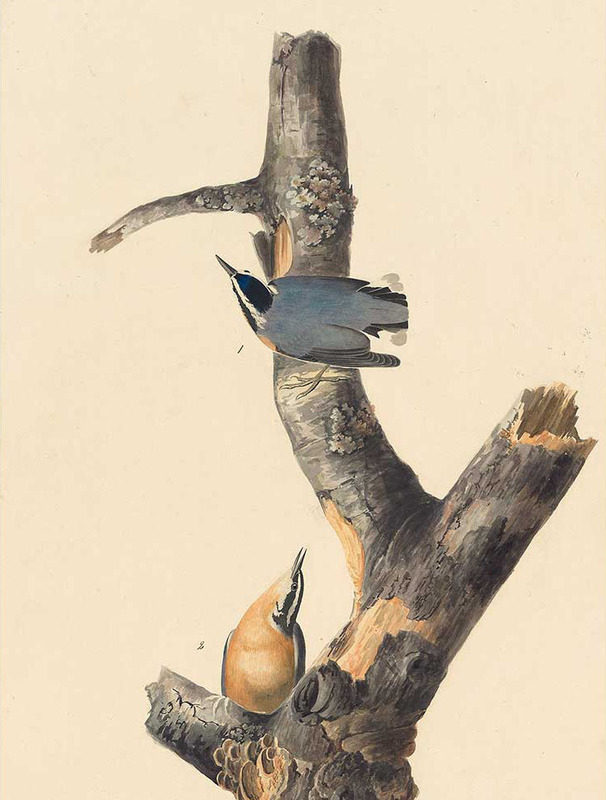 A painting of Red-breasted Nuthatches by early naturalist John James Audubon. 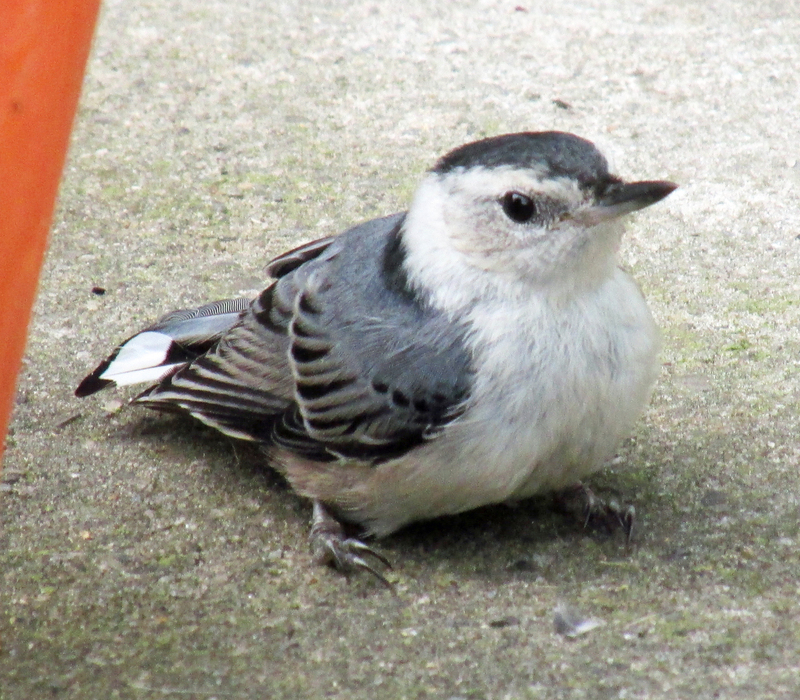 This small nuthatch is not at all common in the region, but there are some records. 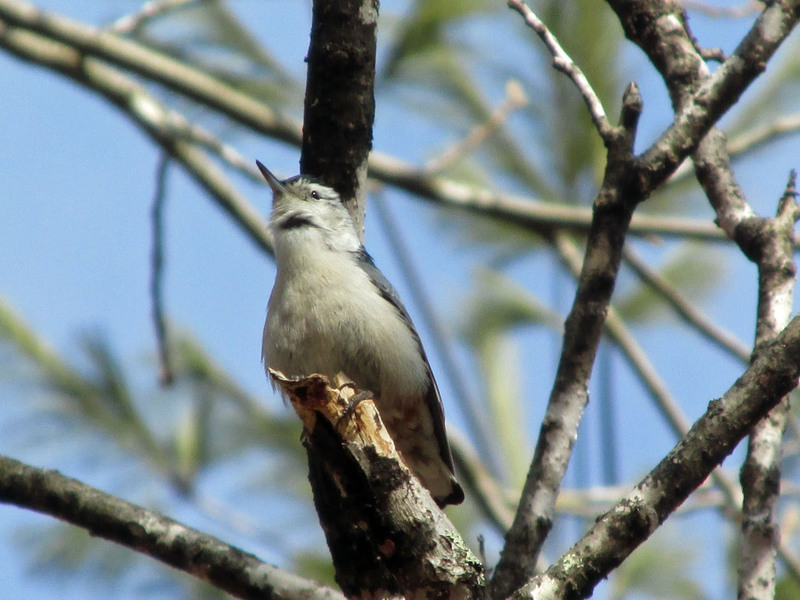 I’ve had much better luck finding the brown-headed nuthatch during visits to coastal South Carolina or suburban Atlanta in Georgia. In these southern locations, it can be a quite common bird. Worldwide, there are about 25 species of nuthatches, some of which have surprisingly descriptive names for birds that spend most of their lives creeping in obscurity along the trunks and branches of trees. Some of the more creative common names for these little birds include beautiful nuthatch, velvet-fronted nuthatch, sulphur-billed nuthatch, chestnut-bellied nuthatch, snowy-browed nuthatch and chestnut-vented nuthatch. These birds are named “nuthatch” for the habit of some species to wedge a large seed in a crack and hack at it with their strong bills. I like to refer to them as “upside-down birds” because gravity doesn’t seem much of a factor in their daily lives. They are content to walk headfirst down a tree trunk or probe the underside of a large branch. It must give them an interesting perspective on the world around them. Photo by Bryan Stevens A White-breasted Nuthatch recovers after striking a window. This entry was posted in Birding, Birds, Our Fine Feathered Friends and tagged Birding, birds, Bristol Herald Courier, Carter County Compass, Elizabethton Star, Erwin Record, Feathered Friends, McDowell News, Our Fine Feathered Friends on February 22, 2015 by Bryan Stevens. I felt really bad for the birds when one of the larger blue spruce trees in the yard came crashing to the ground on Thursday, Feb. 12. At the same time, I felt fortunate that the tree collapsed while I was at work, mainly because it came to rest at a location where I usually park my automobile. Photo by Bryan Stevens The collapse of this blue spruce has left some of the local birds feeling somewhat homeless. The large tree, which still retained a dense growth of stiff, prickly needles on the upper third of its branches, snapped right at ground level. With the horizontal shelter normally provided by the tree suddenly gone vertical, many of the birds looked dazed and confused in the aftermath. 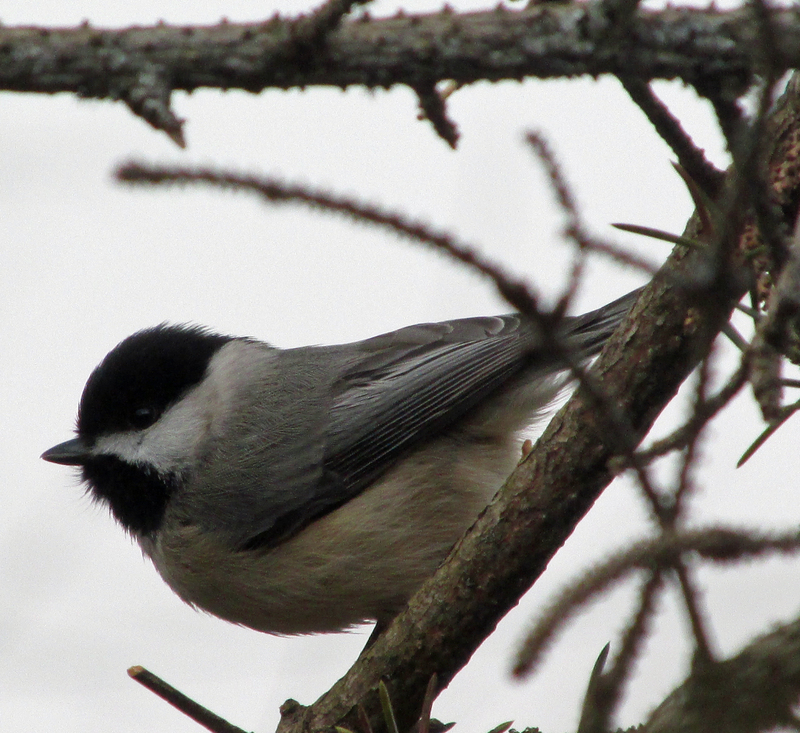 In particular, some of the Carolina Chickadees looked somewhat bewildered and baffled. 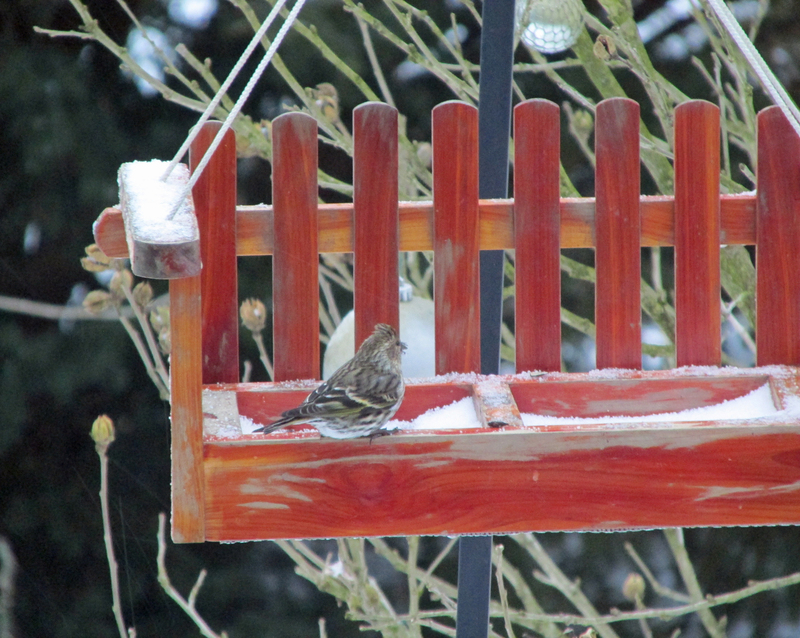 A couple of Pine Siskins looked as if they were confused by the situation. Photo by Bryan Stevens This Carolina Chickadee, perched in the branches of the fallen blue spruce, looked somewhat confused in the immediate aftermath of the large tree’s collapse. Most of the birds have adjusted. In fact, they have found the branches of the fallen tree just as capable of offering shelter from the elements and hiding places from potential predators. The blue spruce was one of five planted by my late father and my late grandfather more than 30 years ago. Two of those five trees are still standing, but two others had already fallen several years ago during storms. 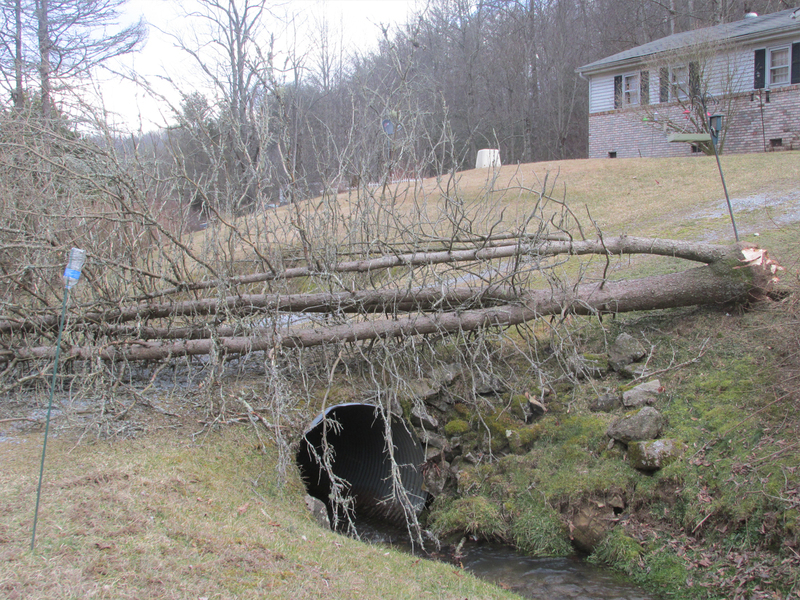 The gusts of wind on Feb. 12 proved too much for the tree. I don’t think blue spruce are particularly suited to life here in northeast Tennessee. They seem more vulnerable to pests and disease than many other conifers. At one time, my father planted some on his Christmas tree farm back in the 1980s and early 1990s. Most people didn’t like the sharp, spiky needles of a blue spruce, although the blue-green coloration often brought admiration from observers. Until they grew more than 12 feet tall, my grandfather used to decorate the two spruces on each side of his home. He would string multi-colored strands of Christmas lights through the branches of the trees every holiday season. Photo by Bryan Stevens Although located next to the fallen tree, this suet feeder continued to attract birds even after the tree collapsed on Thursday, Feb. 12. When the trees grew too big to decorate, the birds became the chief beneficiaries. 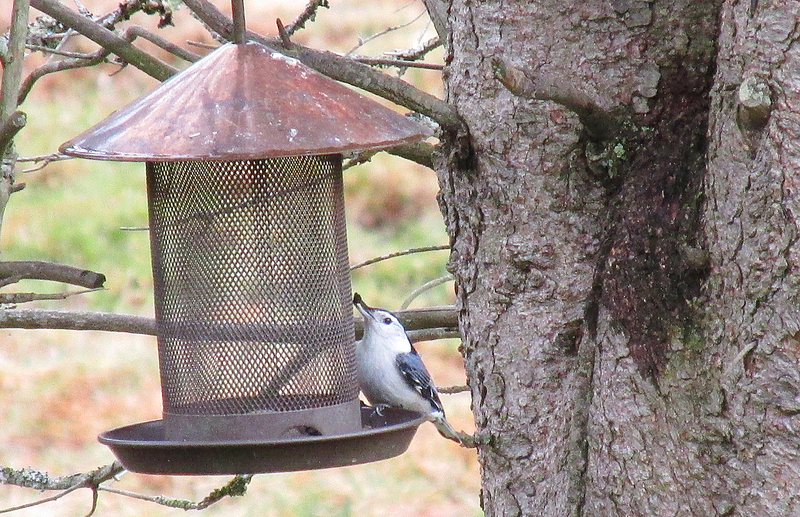 I positioned many of my feeders in the lower branches of several of the remaining spruces. From nuthatches and woodpeckers to chickadees and titmice, a variety of birds liked to congregate within the tree’s branches. 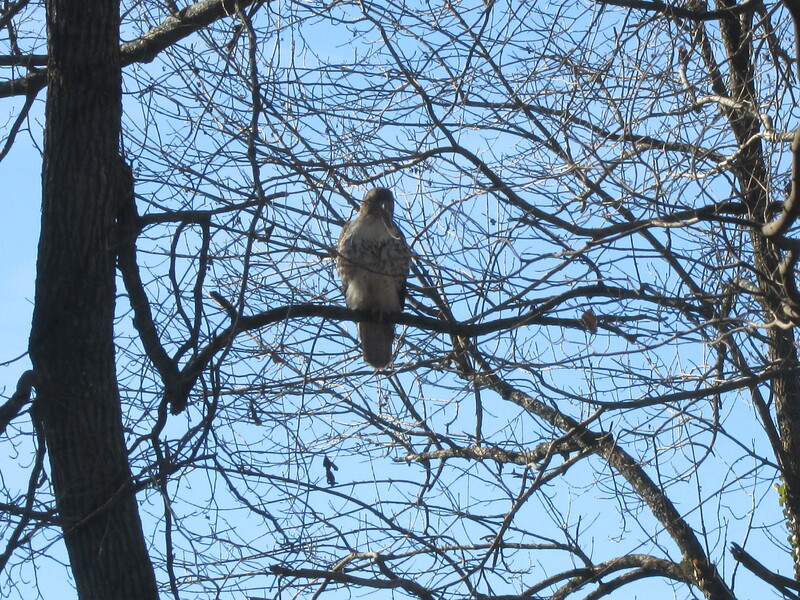 A host of other birds, including Eastern Towhees, Dark-eyed Juncos and White-throated Sparrows liked to feed on the ground beneath the tall trees. In the summer, birds such as Song Sparrows and Northern Cardinals concealed their nests in the thick boughs of some of these blue spruces. I hate to lose a good tree. With these spruces, there are many memories tied to them. I’ll get over the loss, and I hope that, once the shock wears off, so will the birds. After all, if your home came crashing down without warning, you might be a little perplexed, too. I’ve been counting since Friday, Feb. 13, when this year’s GBBC kicked off. I’ll be sharing more about my participation in upcoming posts. 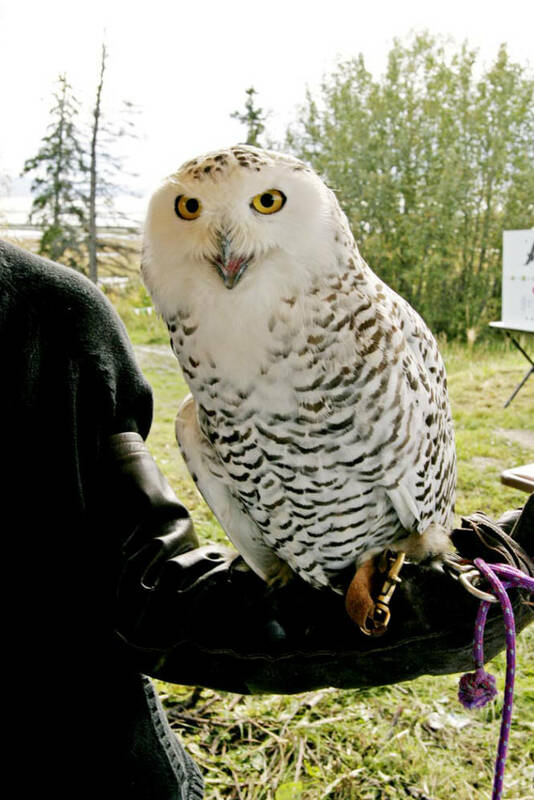 To learn more about birds and other topics from the natural world, friend me on Facebook at https://www.facebook.com/ahoodedwarbler. I’m always posting about local birds, wildlife, flowers, insects and much more. If you have a question, wish to make a comment or share a sighting, email ahoodedwarbler@aol.com. 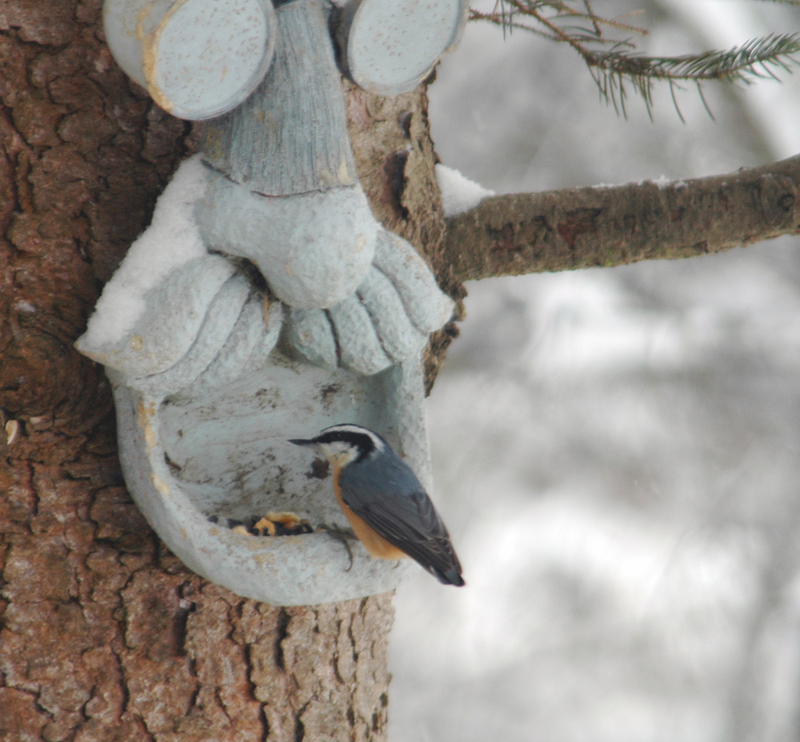 Photo by Bryan Stevens This whimsical feeder is attached to one of the blue spruce trees still standing. Five of these trees were planted about 40 years ago, but only two of them now remain standing. They’ve been magnets for a variety of birds through the years. In this photo, a Red-breasted Nuthatch enjoys some peanuts. This entry was posted in Birding, Birds and tagged Birding, birds, blue spruce, Bristol Herald Courier, Carter County Compass, Elizabethton Star, Erwin Record, Our Fine Feathered Friends, The Erwin Record on February 15, 2015 by Bryan Stevens. 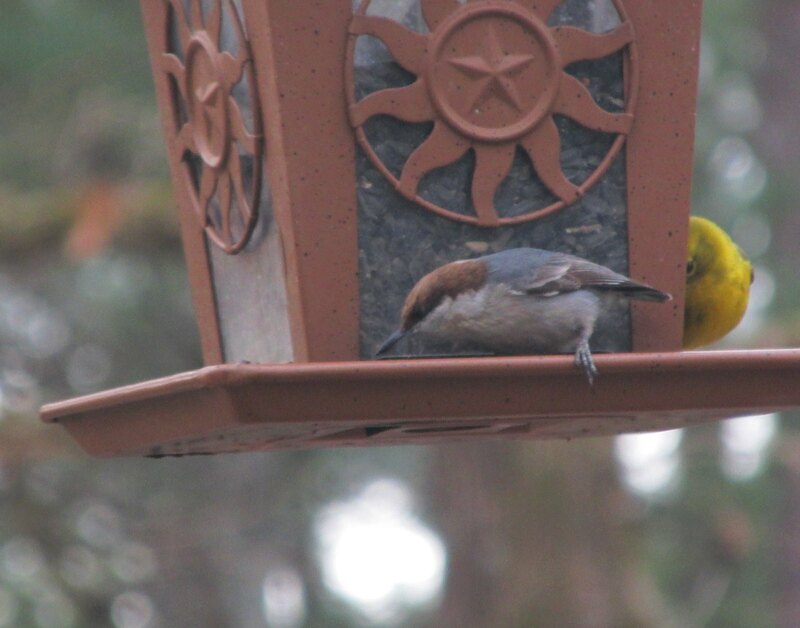 Photo by Bryan Stevens An American Goldfinch, left, and Pine Siskin, right, share space on a feeder. Winters, despite the depressed variety of bird species, can bring excitement when flocks of “irruptive” finches not often seen in the area expand their range into the region. Evening grosbeaks, purple finches, common redpolls and red crossbills represent a few of these northern finches that occasionally stage massive migratory movements, or irruptions, into areas far outside their typical ranges. Photo by Bryan Stevens Pine Siskins visit a feeder on a snowy day. 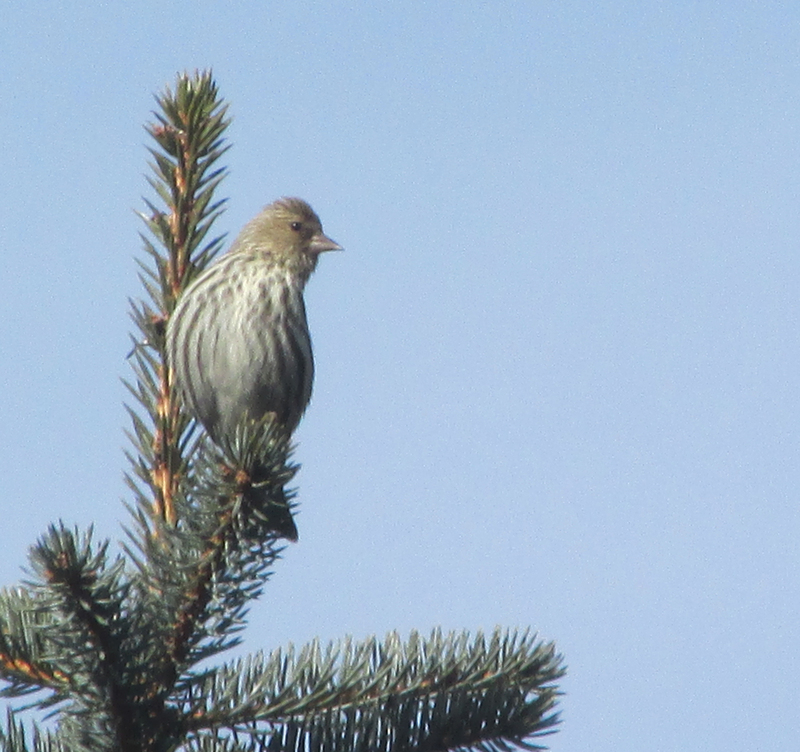 The 2014-15 winter season is shaping up as a notable invasive year for pine siskins, another species of the so-called Northern finches. This small finch is related to and similar in appearance to the American goldfinch. 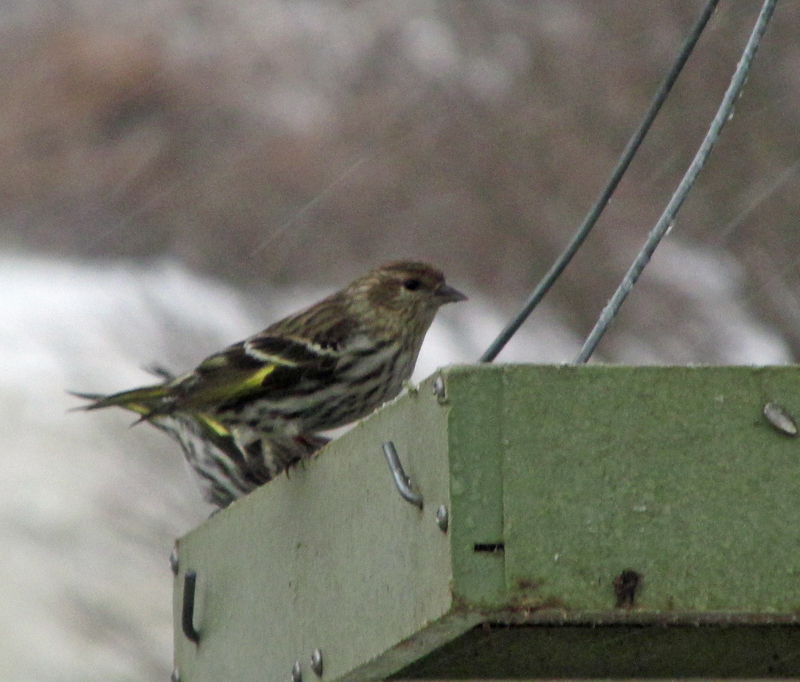 Bristol birder Richard Lewis reported on bristol-birds, an online forum for sharing area bird sightings, that he observed a large flock of more than 100 pine siskins along Caverns Road in Sullivan County about a half mile west of Bristol Caverns. 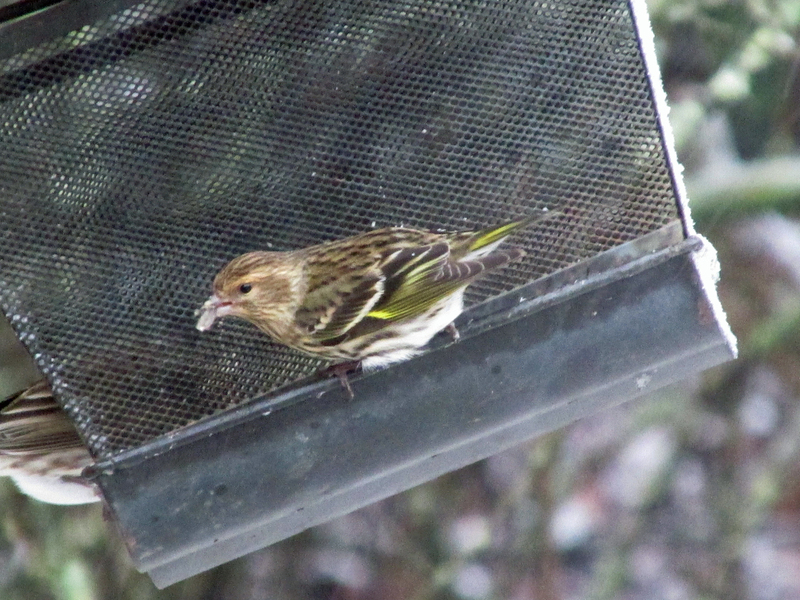 Ron Carrico counted 58 Pine Siskins coming to his feeders on Jan. 23 at his home in Bristol, Tennessee. Photo by Bryan Stevens Large flocks of Pine Siskins are being reported throughout Northeast Tennessee and Southwest Virginia this winter season. They’re not the only people in Northeast Tennessee and Southwest Virginia reporting large numbers of pine siskins this winter. 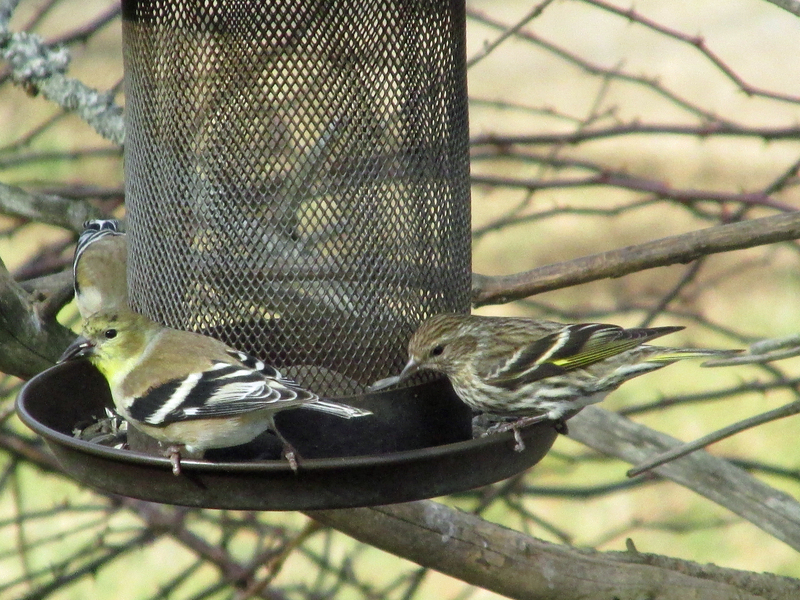 Siskins have been visiting my feeders since this past October, but their numbers began to increase in December. Since then, a flock of about 70 birds, accompanied by lesser numbers of American goldfinches, has become daily visitors at the feeders, enjoying mostly sunflower and nyjer thistle seeds. Siskins are not the only bird to stage irruptions. In addition to pine siskin, the website birdsource.org identifies pine grosbeak, red crossbill, white-winged crossbill, purple finch, common redpoll and evening grosbeak as the birds typically associated with these winter incursions. The website also notes that finches are not the only birds known for these periodic irruptions. Other non-finch species — red-breasted nuthatch, Clark’s nutcracker, bohemian waxwing, black-capped chickadee and varied thrush — undertake periodic winter irruptions. Two of these northern finches — the pine siskin and the red crossbill — are sporadic summer residents on some of the higher mountains in the region. Photo by Bryan Stevens Pine Siskins usually show some bright yellow feathers in their wings and tails. These irruptions are not usually motived by cold or severe weather. The absence of a favored food source on a bird’s normal winter range is usually a trigger for an irruption. Birds, such as pine siskins, will fly farther than normal in a quest for reliable food sources. 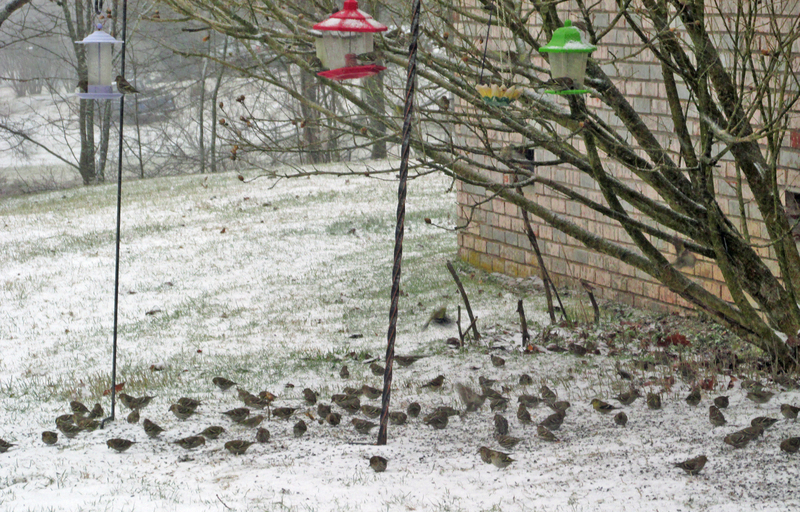 Not surprisingly, well-stocked feeders often attract their attention. Photo by Bryan Stevens Pine Siskins can become frequent feeder visitors during an irruptive winter season. Photo by Bryan Stevens A Pine Siskin perched atop a Blue Spruce surveys its surroundings. 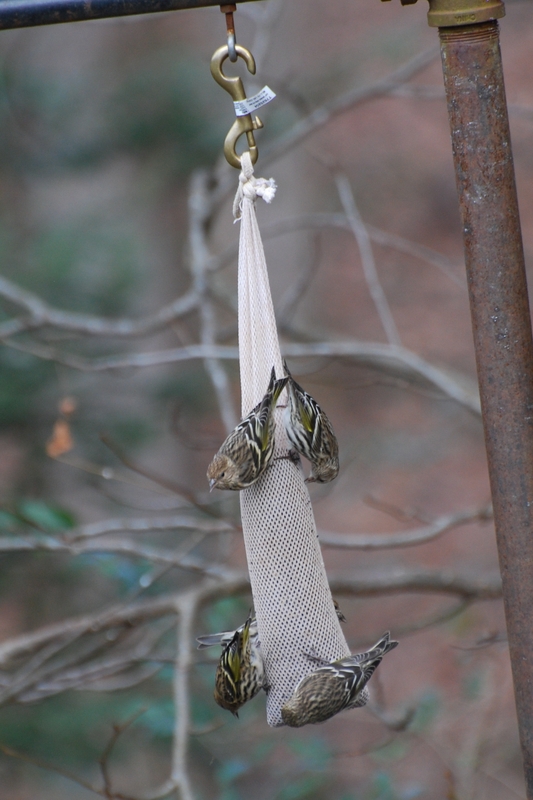 Photo by Jean Potter Pine Siskins feed on thistle seeds contained in a special sock feeder. This entry was posted in Uncategorized on February 8, 2015 by Bryan Stevens.